Road trips are nothing short of thrilling adventures lived on the road. And when you are up for a road trip from Delhi to Leh, you can be sure of a journey of a lifetime. Leh, the capital of Ladakh, is one of the most sparsely populated regions of India. But nature has blessed this high-altitude mountainous land with immense beauty. As you drive away from the historic landscape of Delhi and head towards this undulating rugged land in the Himalayas, situated at a height of more than 11000 feet, you see dreamy backdrops and picturesque locations that are sure to make your journey as exciting as the destination, if not more. Whether you are a true-blue road tripper or one who is just starting out, this is one road journey that you need to experience at least once in your life. So, are you up to the challenge of embarking on a journey in which the adrenalin rush rises up even as the oxygen levels dip down? Then, here comes our guide to take a Delhi to Leh road trip. You can choose from two incredibly scenic routes when taking a trip from Delhi to Leh Ladakh by road. One route traces through panoramic Manali and the other leads you through the astoundingly beautiful Srinagar. Mesmerizing backdrops and adventurous roads are the common factors in both these routes. Yet, each route offers you unique sights and experiences. With enticing stopovers and countless spots to capture mind-blowing photos, a Delhi to Ladakh road trip promises excitement and fun in equal measures. Let’s check out each of these routes in detail. Delhi to Leh by road via Manali is a trail that will take you through many ups and downs, quite literally. This is a two-part journey: the first part is from Delhi to Manali and the second is from Manali to Leh. You can stay at one of the hotels in Delhi and get a good night’s sleep before you start the trip. You will be mostly on NH 1 when you are driving towards Manali. Initially, the road will seem quite normal, but once you start approaching Ghanauli, the uphill climb will begin. Be assured that the refreshing views along the way will more than make-up for the effort you will need to drive uphill. After you cross Manali, the road will lead you through Rohtang Pass, one of the most popular weekend getaways near Delhi. While on this route, you will drive through the some of the highest motorable roads in India and also get to see the entire Ladakh plateau when passing through the Lachulungla Pass. Route: Starting from Delhi, you will make your way through Karnal, Mandi, Manali, Jispa (through Rohtang Pass), Sarchu, Tanglang La, and then reach your destination, Leh. Manali: Nestled amidst majestic hills, Manali is a scenic escape etched in greenery and highlighted with snow-capped mountains. Solang Valley and Rohtang Pass are among the main attractions near Manali that deserve a stopover. 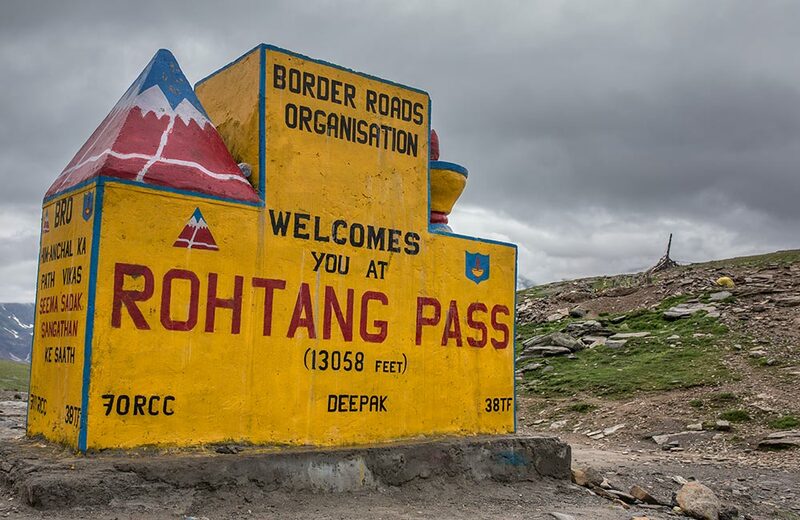 Rohtang La: Considered to be one of the highest mountain passes in the country, Rohtang La is situated on the highway approaching Keylong and then Leh. You can get a glimpse of the incredible meadows, valleys, and mountains from here. The place experiences perennial snowfall, so you can also indulge in a few snow-adventure activities, like snowboarding and skiing. Keylong: Keylong is located in the Lahaul Spiti region and is considered to be a slice of paradise on earth. 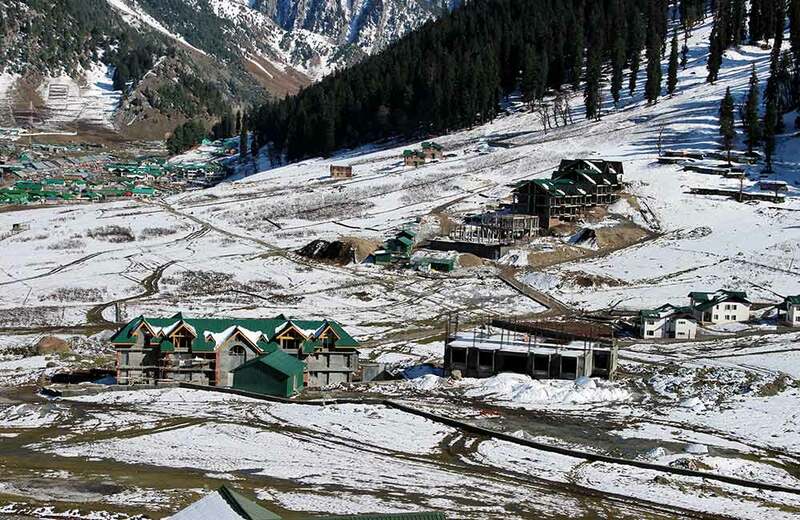 Blessed with abundant greenery, the place boasts of snow-capped mountains and sparkling rivulets. Gemur and Shashur are two monasteries that you can visit during your stopover at Keylong. Jispa: Most tourists following the Delhi to Ladakh roadmap select Jispa for their overnight halt. Camping in open fields at an altitude of above 10,000 feet has a charm of its own, don’t you agree? Also, Jispa is blessed with an amazing landscape that adds to the allure of the place. Darcha: A scenic village located at a distance of 23 km from Keylong, Darcha stands surrounded by pristine valleys and mountains. It is an excellent location for camping and trekking. Baralacha La: The scenic Baralacha La mountain pass is located in the Zanskar region and connects Lahaul to Ladakh. You will be able to have a nice glance over the three valleys that surround this pass that stands at an altitude of more than 16,000 feet above sea level. Sarchu: Sarchu aka Sir Bhum Chum is yet another stunning region that you will come across during your Delhi to Ladakh road trip. If you are up for an overnight halt at Sarchu, opt to stay in a camp in one of the open fields dotting this landscape. Sleeping under the starry sky is an experience that you can’t enjoy in the places to visit in Delhi. Gata Loops: Those adventurous souls who undertake the journey from Delhi to Leh by road on bike are going to love passing through Gata Loops on their way. This place is often associated with ghosts! We can’t say for sure whether you will encounter any ghosts or not, but you will definitely come across some excellent views of the region. Lachulung La: Your trip from Delhi to Leh by road will lead you through this pass that remains open for just less than five months in a year (that is, during the summer). Situated at a distance of 54 km from Sarchu, the pass boasts of matchless mountainous beauty. Tanglang La: Tanglang La is considered to be the second most significant mountain pass in this region, second only to the Khardungla Pass. The gorgeous views of the surrounding areas make a stopover to this place worth your time and energy. Upshi: A picturesque village standing on the banks of River Indus, Upshi is a delightful place to spend a few serene moments. The village stands near an age-old trading route that once served as the link between Tibet and this region. You can find quite a few decent places to eat at Rohtang Pass and Sissu, though they may not be as posh as the restaurants in Delhi. Keylong is another place where you can find a number of good restaurants. Zingzing Bar is perhaps the only place that offers not just food but lodging facilities as well. Manali has a few petrol pumps where you can fuel up your vehicle. Moving ahead, you can find the next petrol pump at Tandi, about 110 km from Manali. If you need to refuel further ahead in the journey, you can do so at Karu, which is about 345 km from Tandi and just 30 km from Leh. A trip from Delhi to Leh by road via Srinagar allows you to experience not just natural beauty but some man-made creations as well. As you drive out of Delhi, you will be heading towards Amritsar, one of the most popular tourist destinations in India. This route is often preferred by history buffs and religious souls out on a Delhi to Ladakh road trip. While traveling on this route, you will come across picturesque villages, war memorial, Gurudwara, monasteries, and not to mention the immensely beautiful landscapes. Be it the gleaming Golden Temple or the green fields of Sonmarg, you won’t be short of sights and scenes to soak in during this trip. But remember, sometimes the roads can be really treacherous or rough. So, brace up to face a few hostile conditions while enjoying the scenic delights. Route: Commencing in Delhi, this trip will lead you through Amritsar, Srinagar, Sonmarg, Drass, Kargil, Lamayuru, before you reach Leh. Amritsar: Steeped in rich history, Amritsar is where you will be able to witness the beauty of the gorgeous Golden Temple and pay your tribute at the Jallianwala Bagh. The Wagah Border nearby is another attraction of this place. Srinagar: Standing on the banks of River Jhelum, Srinagar is one of the most scenic cities in the Kashmir Valley. Bordered by evergreen mountains, the placid Dal Lake with its lovely houseboats, adds to the beauty of the place. Sonmarg: Alpine forests, green meadows, and incredible views of the surrounding glaciers, like the Machoi Glacier and the Kolhoi Glacier, make Sonmarg a must-visit spot en route. Drass Valley: The Drass Valley is known as the Gateway to Ladakh. Situated along the Drass River, the valley craves attention not just for its natural beauty but for its hot springs as well. Kargil: Kargil boasts of being the second largest town in Ladakh, the first being Leh. The rugged mountainous terrain of this region is a pleasure to witness on any day. While you are to your way to Kargil, make a detour for the Suru Valley. It is considered to be the greenest valley of the Greater Himalayas. Mulbekh: Nestled atop a hill, the Mulbekh Monastery is famous for its two gompas. The monastery has two sub-monasteries within its premises, known as Gelugpa and Drukpa. The statue of Maitreya Buddha is a key attraction here. Lamayuru: Listed among the largest and oldest monasteries in Ladakh, the Lamayuru Monastery is an enticing sight to behold. It stands on a steep mountain and offers exceptional views of the surrounding areas. Moonland: If Ladakh is called the Heaven of Passes, the Moonland region is the Heaven of Adventure. The serene and picturesque region is among the most fascinating places to stop at during your road trip. Alchi: A quaint village in the Leh district, Alchi is well-known for the Alchi Monastery. It is an ancient monastery dating back to the 12th century and is definitely worth a visit. Likir: Situated in the Leh area of Jammu and Kashmir, Likir is a lovely town famous for the Likir Monastery. Built in the 11th century, the monastery houses a 75m tall statue of Lord Buddha, which is a sight to behold. You will find a number of eateries and restaurants in Amritsar to appease your hunger while traveling from Delhi to Ladakh by road. Like the pubs in Delhi, this historic city also has a number of pubs where you can have a nice time. The lovely hill station of Patnitop is another place where you can expect to find good quality restaurants. Further along the way, Sonmarg and Srinagar have many a good place to satisfy your culinary cravings. You will also find a few dhabas lining the national highways and offering food to the hungry souls. There is no dearth of petrol pumps in Srinagar. Once you head out of this city, the next petrol pump can be found at Mangan, around 32 km from Srinagar. For your next refueling, you will have to travel 48 km and reach Sonmarg. Make sure to fill up your tank at Sonmarg because you will find the next petrol pump after 124 km, at Kargil. About 40 km from Kargil lies Mulbekh, which is the location for the next petrol pump on this route. When you finally reach your destination, you can continue to explore the town and its surrounding areas. You can even arrange for your stay in one of the monasteries for a couple of days to experience the way of life there before driving back to Delhi. You will find it a unique experience, for sure. With such attractions and experiences beckoning you, isn’t it time that you give a heed to the call of the mountains and hit the pedal to the metal?